"Cluefinders Search & Solve Adventures"
Venture into a haunted amusement park and learn critical thinking and problem solving skills. 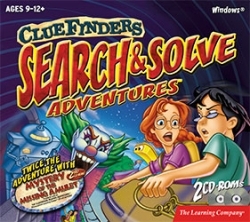 In "Cluefinders Search and Solve Adventure", your young students will assist the Cluefinders in surveying the night sky, the ClueFinders spot flashing lights beaming from an old, abandoned amusement park. It’s an SOS! Investigate in the dead of night! Learn deductive logic, ordering, sequencing, hypothesis testing, spatial reasoning, and more as you search for clues to solve the mystery.